Buffalo Backpackers i Pristina, Kosovo: Bestill nå! Buffalo Backpackers is located in the city center: the heart of Pristina. Everything the city has to offer is a quick walk away. Buffalo’s unique charm comes from a local Albanian and a Texan who have combined their experiences and passions to create a hostel that you can call your home away from home. We love Kosovo, and we want you to love it too! 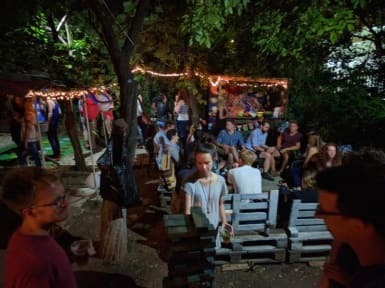 Our hostel is surrounded by a large garden that can be your oasis in Pristina – with a back garden bar, fire pit, garden games, hammocks, fruit trees, and more! Buffalo Backpackers garden is the perfect place to pass time with new friends! We’re committed to providing a spacious and friendly environment to meet all of your travel needs. Just inside the house we have a common room and full kitchen stocked with cooking essentials. We have comfy sofas, games, a book swap, a clothing swap and an exhibition room where you can learn about Kosovo’s history. Buffalo Backpackers offers day trips in our VW hostel van! You can chose from a variety of seven different adventures around Kosovo. Our trips range from mountain and waterfall tours, to historical sites and local wine and raki tastings. Our guests receive FREE large storage lockers, breakfast, coffee and tea 24/7, city maps and Wi-Fi —not to mention a wealth of cultural and traveler information from our great staff. Whether you’re just passing through or need a home base to explore Pristina and the rest of Kosovo, we’re here to make your trip a great one.